High pressure out west brings warmer temperatures to the entire region into next week. Strong winds (25-40 mph) across Southern California and the southwestern desert regions continue into the weekend. Seasonal temperatures look to continue across Mexico into next week. A cold front moves into Florida tomorrow with rain and winds, especially to the north. Another more powerful system brings rain to the entire state on Monday into Tuesday. California and Yuma trucks are both remain steady this week. Washington apple trucks are steady as well. Idaho potato and onion trucks remain extremely tight. Colorado trucks are also extremely tight. 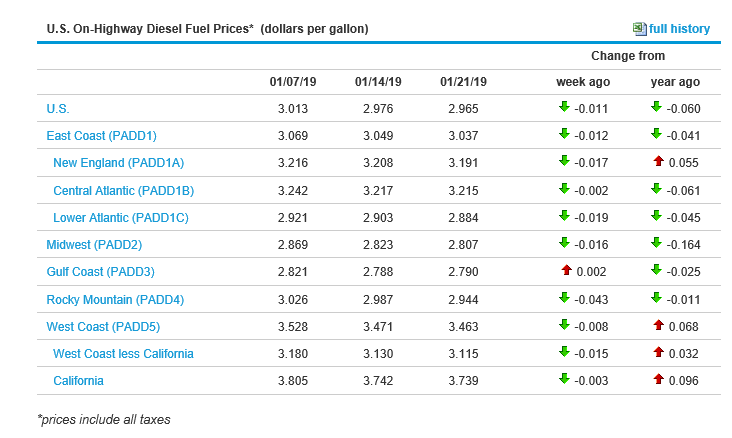 The national average on diesel remained steady this week and is currently at 2.965 per gallon. California prices remained steady as well and are now at 3.739 per gallon. Crude oil prices remained steady and are currently at 53.03 per barrel. Supplies of small Granny-Smith and Gold Delicious 100 and smaller remain short with a strong market. We will have to continue to sub sizes and grades to get covered. Expect this to continue through the balance of the season. All Red Delicious and Red varieties are steady with a moderate supply of sizes and grades. Quality is good. Weather has improved in Caborca Mexico, production is starting to increase. More fields are opening up daily, and we should see much better volume by next week. Volume from both regions in Peru (Trujillo/Ica) continues to decline due to seasonality, and warmer weather. Most growers in Peru have wrapped up their season. The demand and the market are still very good on both coast with volume just barely increasing this week from Mexico, but that will change in the next week to 10 days with more volume from Mexico. The weather this week in the growing region of Michoacán Mexico calls for temps in the 80s with no rain in the forecast. Market this week is steady and peaking on 48s. Light volume this week on 60s and 70s. There is also plenty of #2 grade fruit as suppliers are looking to move some volume. Reports of the market price coming off after the Super Bowl. We will see California fruit next month. Bell Pepper is very tight and may get tighter in Florida by this weekend of early next week. Supplies have been tight since the start of the season, mainly due to weather conditions in the growing region. The effects of the storm that passed through the region just before the New Year are showing up now in reduced yields. Cold temperatures early this week and another wave coming this weekend will also reduce production. Quality is still holding up in most locations but size is trending smaller with very few jumbo and extra-large size being packed. We expect supplies to be tight for a few weeks. Bell pepper supply is very tight. Green Bell Pepper- Moderate volume on green bell pepper continues to arriving in Nogales this week. Currently, consistent volume is being harvested in Sinaloa and Sonora. Quality on green bells from both regions is good. Supplies meet demand on green bells. Market on Green bells is steady and expected to remain steady. Green bell pepper from Mexico is also available to load in McAllen, TX. Red Bell Pepper- Good volume of Red Bell pepper available to load in Nogales, AZ from Mexico. The price on the red bell pepper has decreased to a fairly low market. Good volume of Elongated and Hot House bells are being packed in all pack styles. Consistent numbers of red bells are expected to continue through the end of the week. Quality of red bell on both varieties is good. Red bell supplies from Mexico currently crossing through Nogales, AZ, and McAllen, TX. Yellow Bell Pepper- Good volume of Yellow Bell pepper arriving in Nogales this week. Good weather in the growing region has increased the yellow bell pepper production. Both elongated and Hot House varieties being pack in 11lb/15lb and 1 1/9 bushel carton. Quality on both varieties is good. Currently, supply meets demand. Market on yellow bell is steady. Yellow Hot House bells are also available to load in McAllen, TX. Blackberries are steady with most of the volume coming out of Central Mexico. The market is relatively unchanged with the bigger mix berry shippers experiencing better movement than the isolated brokers servicing the terminal market sector. As with the blueberries there is the occasional deal to be had out there with the blacks. This usually comes from importers looking to move the odd extra pallet or two to keep inventories clean. the market should remain at this level as the weekend draws closer. Blueberries are increasing in supply as the Chilean import deal starts to turn up the volume . Offshore containers are arriving in clusters in Miami Fl., Los Angeles Ca. and Philadelphia Pa. There are volume deals to be had as importers are feeling pressure to stay ahead of new product arrivals. Mexico is still producing good numbers of fruit to compliment the blues ,blacks, raspberries and strawberries already shipping out of Texas , Yuma and Dover Fl.. Quality remains good if rotated properly out of all areas. Look for the market to ease down slightly with the influx of additional Peruvian offshore fruit. Shippers providing all 4 categories of mixed berries are likely to remain somewhat firm due to better movement of inventories. Raspberries continue to be readily available this week coming out of Mexico and delivering into Oxnard Ca, Yuma Az and Dover/Miami Florida. There are also several mixed berry brokers bringing them into the Los Angeles area for distribution. Quality remains good out of Mexico. Market pricing remains fairly steady with the occasional deal becoming available for fruit beginning to feel its shelf life limitations and in need of movement. look for this trend to continue into the weekend. California strawberries are still very limited in supply. There is light at the end of the tunnel as we move into the weekend just days away from the Valentines day pull. No rain and rising temperatures up to the low 70s in Oxnard and Santa Maria should provide better numbers and finer quality for this weekend and on into next week. Pricing remains steady and the short numbers of California fruit continue to make it necessary for most shippers to subsidize their inventories with Mexican product. Look for the market to remain firm going into the weekend with some open market fruit becoming available in limited numbers. Florida strawberries remain in light supplies due to at or near freezing temperatures From Ocala Florida and north. This is causing minimal growth in the fields. Adding an increased challenge, rains are scheduled for Wednesday which is sure to further challenge harvesting and minimize yields. Look for a strong steady market in Florida through the week coinciding with the diminishing supplies. The broccoli market has started to come off as better supply and yields have come on. The weather is starting to cooperate in all growing areas and suppliers are looking at better #s. Quality is good with slight purpling, some mechanical damage, and occasional yellow cast. Look for supplies to continue to be good going into next week. Cauliflower market has come off as there are more supply and better yields coming on. Supply has started to pick up with the warmer weather in Yuma. Overall, the quality is good with minor bruising and some yellow cast with weights in the 25 to 28-pound level. Look for this market to continue to adjust going into next week. Demand exceeds supplies with this commodity. Expect this to continue throughout the week. Escalated pricing is in effect on contract as well as value added items. Production in Yuma continues to be light as weather conditions have slowed the growth down considerably. Southern California is moderate to light. The best offers will be in southern California but the gap has closed considerably. There is a little of all sizing, but no sizes are overabundant with any shipper. Common defects that have been reported include leafiness, mechanical, bowing, and muddiness to the boxes as well as being on the commodity. Wet fields caused by heavy rains is a direct cause of the defects mentioned earlier. The import cherry season is coming to an end. We expect to see very limited amounts of fruit trickle in for the next 1-2 weeks before all shipments stop. Market prices have been steady and quality is good. Demand has been low. We will transition into domestic harvest over the next 4-6 weeks. We will see a gap in supplies in between. Import season is ending, domestic harvest is still 4-6 weeks away. Jalapenos- A little better supply of Jalapeno than last week available to load in Nogales, AZ from Mexico. Growers continue to harvesting jalapeno out of the Sonora and in Northern/Southern Sinaloa. Quality out of Sonora is Fair to Good. Quality out of Sinaloa is good. Mostly medium to large size available from both growing regions. Market on jalapeno is high and expected to remain high through the week. Price on #1 jalapeno is currently high and is expected to remain there into next week. Jalapenos from Mexico also available to load in McAllen, Texas. Anaheim- Good supply of Anaheim available to load in Nogales, AZ from Mexico. Good Anaheim production expected to continue through the week. Anaheim crossing through Nogales is currently being harvested in the Mexican states of Sinaloa. Quality of peppers from Sinaloa is good with mostly large size being seen. Market on Anaheim is steady along with pricing and is expected to remain steady through next week. Anaheim from Mexico also available to load in McAllen, Texas. Serrano – Very limited supplies of Serrano peppers continue to be available to load in Nogales, from Mexico. Supplies expected to remain light. The demand and market continue to be high along with pricing. Price on Serrano pepper continues to be priced at $70.00 on a 40lb box of serrano and expected to remain steady through the week. Light supplies of Serrano also crossing into McAllen, Texas. Tomatillo – Husk and De husked tomatillos are available to load in Nogales, from Mexico. Good supplies on both varieties expected to continue through the week. The tomatillo market is steady. Prices remain steady in the mid-teens. Quality on both varieties is currently good. Both varieties of tomatillos also available to load in McAllen, TX. The Cilantro market continues to be tight as a result of the colder weather and rain in Yuma and Mexico the last couple weeks. The cilantro quality is fair and has been affected by this colder weather. Look for the cilantro market to continue to stay strong going into next week. Current supplies and markets are steady. District 3 is wrapping up for the season a few shippers looking to finish after this week. District 1&2 volume is slowly building inventory and peaking on 75ct/95ct/115ct size to start. Due to the weather, the smaller size fruit is looking to tighten up for the next couple of months. The rain and cold weather brought on the larger fruit and smaller fruit is staying limited on sizing and green on the trees. Normal business on small fruit looks okay for now but could get snug in the next few weeks. Lime supplies are tight, market prices are active and climbing weekly. Most suppliers are thinking this could continue until April/May. With the current rain, cooler weather in the growing regions in Mexico, and limited inbound of trucks crossing from Mexico this is collectively causing the high market prices. This is an industry-wide issue and we'll continue to monitor this closely with updates. Current market prices on 10# are $8-$10, and the 40# current market prices are $18 - $20. California Navels is back in with good supplies this week. Markets are steady plenty of promotable volume and great quality to start off the week. Demand continues to feel strong as we approach the end of January. Suppliers are harvesting good numbers and moving through inventory weekly. With the good movement, the bigger harvest numbers are welcomed. Color and flavor are excellent and Brix averages are climbing to 13-14 as we are into some of our best varieties of the season. Continue to push Navels with confidence – This is the best time of the year for great quality and we will continue to see great quality moving forward. The pack has been majority fancy grade with limited choice grade availability. Satsuma Mandarins supplies are ample on any size or pack style. Brix is 12-14 and extremely juicy. Delite Mandarins are coming along peaking on 32/28/24 followed by size 36. Plenty of Pummelos available sizing and quality look great. Cara Caras & Blood oranges have started with supplies getting better by the week. Cucumber supplies are very steady coming into South Florida from Honduras. Supplies crossing from Mexico are picking up taking some of the pressure off importers in Florida. Markets are remaining steady but expect to see some more supplies showing up by the weekend. Quality is good with all importers, inventories have been kept fresh and moderate temperatures in Honduras are producing good color on the fruit. Light supplies of cucumber being harvested in Sonora, Mexico. Quality out of the Sonora district is mostly fair. Moderate supplies of cucumbers also being harvested in the Mexican State of Sinaloa and the volume expected to increase as we move into next week. The cucumber market is lower and expected to remain low throughout the week. Quality out of Sinaloa is good. Eggplant supply is very tight, especially on fancy product. Growers in south Florida are still cutting in older fields producing choice product but very few fancy eggplants. Newer fields that are the primary source of the fancy product are very small this time of year. Cold temperatures and high winds have caused low yields for the past month. Expect the supply to be very light in Florida through the month of February as the acreage has been reduced over the past few years. Quality varies from shipper to shipper, some scaring and discoloration are showing on eggplant that was hit hardest by high winds. Eggplant supplies are tight in general but extremely tight on fancy product. Eggplant- Eggplant continues to be harvested in the Mexican State of Sinaloa. Light supplies of eggplant currently being harvested and expected to continue light through next week. Both fancy and choice grade currently being packed. Current market on eggplant is high and is expected to remain high through next week. Quality from Sinaloa currently is mostly fair to good. Green grapes are extremely limited currently. As a whole, the industry is down 35-40% year over year on the volume of import grapes. Green grapes in particular are eve more limited as the volume of red to green grapes being shipped to the U.S is around 3 to 1. Demand continues to be very strong. As fruit gets released, orders that have been booked are getting filled. Same day or next day orders are very difficult to fill at this time. The more advance notice, the better. Markets are higher and quality is fair. We are seeing some discoloration and soft berries. The anticipation is to see better availability by the second week of February. Until then, we can expect to see some challenges. Green grapes are extremely limited currently. Markets are higher and quality is fair. We expect better availability in 3 weeks. Supplies continue to be limited this week. We started the week with very little fruit being released and unloaded at the docks. Shippers are expecting more arrivals by Thursday of this week. That fruit is expected to be released and ready to ship by the weekend. However, due to the high demand and low supplies, most of the fruit is already sold. Looking at total volume of import grapes year over year, the industry is trending 35-40% less than last year. This is a result of Chilean and Peruvian growers diverting a large portion of fruit to Asia and Europe due to the saturated and depressed markets of California fruit all summer. They did not expect California supplies to come to such an abrupt end. This equates to a very strong market and limited availability as the industry is relying heavily on import fruit to fill demand. Quality on the red grapes has been good with occasional soft berries being reported. Market prices are higher and firm. We expect supplies to improve over the next 2-3 weeks. Supplies remain very limited. Markets are higher. The Green Onion market continues to be really tight with the recent freeze and rain in Mexico. This cold weather has been causing occasional leaf minor and mechanical damage. The green onion market will continue to be very tight going into next week. Limited demand has led to a surplus of supplies in the marketplace. There is a variance of two to four dollars amongst the multiple suppliers in this industry. The weather has been warmer in Yuma compared to past weeks and there is no rain in the forecast this week. Defects have been reported, however. These defects include epidermal peel, puffiness, ribby, and mechanical. The quality of this commodity is fair. Processors continue to create awareness on shorter shelf lives of processed lettuce items. This will continue through the month of January. Labor issues continue to exist, but reports indicate some improvement. Weights on palletized will be 37-40 pounds on average. Offers are abundant on romaine and romaine hearts. Needless to say, this market is flat. Consumers continue to have fear in consuming this commodity on a regular basis. Green and red leaf, as well as butter, has softened as this market overall has had minimal demand to begin the week. The weather in Yuma will be warmer throughout this week. Defects, however, will continue to be seen likely throughout the month. These defects include blister, cupping, mildew, fringe burn and mechanical. Yields continue to be down but demand is being covered with most suppliers. Keep in mind the value-added product with leaf items will have a shorter shelf life due to the weakness of the raw material being used. The Tender Leaf market continues to be strong on spring mix, arugula, baby spinach, and cello spinach with the recent rain and colder weather in Yuma. Quality issues are fair with minimal yellowing and bruising of the tender leaves. Look for these items to continue to remain strong going into next week. Weather in Zacapa, Michoacán calls for temps in the 80s-90s with some rain in the forecast. Weather in the growing region of Choluteca, Honduras calls for temps in the high 90s with no rain in the forecast. We are continuing to battle field issues in Guatemala which is reducing yields and providing smaller sizing. This will be an ongoing battle over the next few months. We anticipate again seeing a significant decrease in production the week after next. This could be an ongoing struggle through February and early March. The current market is steady with overall good quality. Weather in Zacapa, Michoacán calls for temps in the 80s-90s with some rain in the forecast. Weather in the growing region of Choluteca, Honduras calls for temps in the high 90s with no rain in the forecast. We are continuing to battle field issues in Guatemala which is reducing yields and providing smaller sizing. This will be an ongoing battle over the next few months. We anticipate again seeing a significant decrease in production the week after next. This could be an ongoing struggle through February and early March. The current market is steady with overall good quality. Smaller sized fruit is harder to come by (8s & 9s). Demand exceeds supply. Light supplies of watermelon continue to be available to load in Nogales, AZ. Light volume continues to cross through Nogales, AZ as demand remains high. Few shippers are receiving watermelon from Jalisco. New crop mini watermelon also available to load in Nogales from Colima. Market on watermelon being reported as high and expected to remain the same through the week. Quality on new crop watermelon being reported as good. Yellow and Red onions markets are steady out of all shipping points. White onion market is in a demand exceeds supply situation. This is due to the Northwest supplies seasonally winding down and supplies of the new crop from Mexico will not be ready. New crop supplies out of Mexico will start to come into play in the next couple of weeks. This will bring the market back into check. Quality of the northwest storage onions is still good with little to no issues upon arrivals. Look for the Yellow and Red onions markets to be fairly steady for the next couple of weeks. Pear demand is moderate with steady pricing on most sizes of D'Anjou. Sizing is peaking on 70/80/90 with a good mix of US# 1 and Fancy. Quality is good. Bartlett pears are peaking on US #1 80-100 count with few fancy's. Quality is good but only order what you need as they will not hold up. The market is fair. Bosc is peaking 90 count and smaller. Quality is good. The first shipments of new crop Chilean Bartlett pears will hit the end of this month and will be available out of Philadelphia. Russet potato carton market continues to rise each week on 80 counts and larger. This is in part due to light demand on retail bags which has some shipper only running limited hours and most growers finishing up with the larger Norkotah variety. A few growers will still have limited supplies of Norkotah's till sometime in March. Burbanks are the main variety which are peaking on 80 count and smaller. Will this be the trend through the balance of the season? Or are the growers holding on to their larger potatoes. Only time will tell. It is a good time to stay ahead of supplies. Quality is good with little to no issues upon arrival. Color potato market on Red, White and Golds is steady on all sizes. Quality is good with little to no reports of issues upon arrival. Zucchini squash supply is starting to rebound but yellow supplies are very tight. Yellow squash is not as hardy as zucchini and plants have not rebounded from storms in the past month. Quality on zucchini is good, yellow is hit and miss with some scaring and brown discoloration due to wind and cold temperatures. More supply crossing from Mexico is taking some of the pressure off eastern shippers but another round of cold weather coming this weekend could slow production in south Florida. We expect better supply on both colors of squash for the next few days but that trend could reverse itself but early next week. Better supply on zucchini but still very tight on yellow squash. Italian and Yellow S/N- Better supplies of Italian and Yellow S/N crossing through Nogales from Mexico this week as growers in the Sinaloa district begin to harvest in new fields. Supplies are expected to increase as we move to the end of the week and into next week. Both #1 and #2 quality continue to be packed on Italian and Yellow S/N. More #2 than #1 is packed on Yellow S/N. Quality on both #1 pack and #2 pack Italian squash is good. Quality on #1 yellow squash is good. Quality on #2 yellow squash is fair. Demand currently exceeds supplies on both varieties but supplies are expected to meet supplies by the end of this week. Stone fruit availability is slowly improving. We are expecting another arrival of fruit this week. These containers should consistent of yellow peaches, yellow nectarines and some plums. The plums are a mix of red and black. Sizes on all fruit have been fairly large with a big portion of the fruit being packed into 2 layer tray packs and very little volume fill. The volume fill fruit is primarily 60ct. We hope to see better availability of the volume fill sizes as we move forward. Quality has been solid on the fruit we have seen thus far. Market prices have been steady, but will hopefully adjust down as more fruit becomes available. The Florida growing regions have completed the transition to southern fields in Naples/Immokalee and Homestead districts. Production is steady at this time with a favorable weather forecast today and tomorrow, and then 100% chance of rain Thursday. Farming operations are between crown picks and 2nd harvest helping to improve the gap in size of round tomatoes from previous weeks. Quality remains good but a fair amount of #2 fruit is available as a result of recent rain and wind. Roma tomatoes remain a light crop with a bulk of supply coming from Mexico as planned for the season. Grape and cherry tomatoes are steady, and with sunshine in the forecast for a few days this week, markets are steady going into next week. The much-anticipated tomato volume from Mexico has made it to market this week bring all items to, or close to, suspension agreement minimums. Weather forecasts continue with a warm trend through next week helping to bring a boost in production to Mexico farms. There is a good supply of large rounds and plenty of volume spanning all varieties. The improved supply should help to ease FOBs in the east that has been near or above the $20 mark since November. 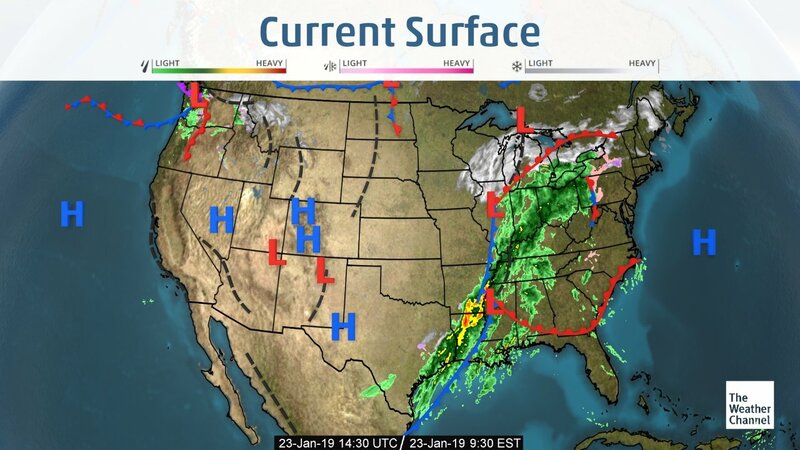 With more favorable growing conditions in the coming week, January should continue into next month with affordable markets and healthy supply.